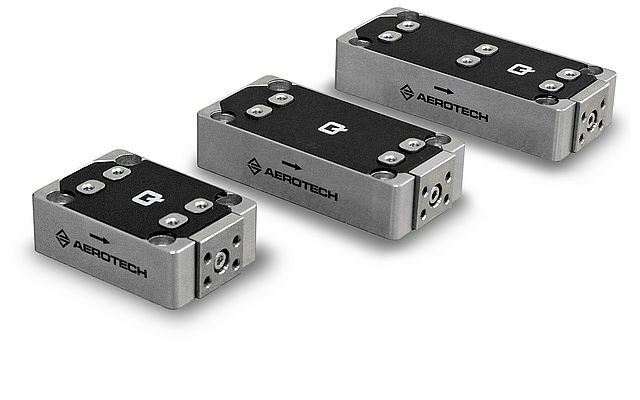 Aerotech presents the QNPHD linear piezo nanopositioning stages that provide the benefits of both a stage and actuator in one compact, high-stiffness package. With a direct-metrology, capacitive sensor feedback option, high resonant frequencies, and high load capacity, the QNPHD is ideal for a wide range of high-speed and high-precision applications such as scanning probe microscopy, disc-drive testing, and semiconductor wafer articulation. A direct-drive actuation design and optimized structure enable millisecond response and move-and-settle times. FEA optimized precision flexures ensure high-stiffness, long device life, and high-dynamics while maintaining excellent geometric performance (straightness and angular errors) for critical nanopositioning applications. Optional closed-loop feedback using a unique capacitive sensor design allows for sub-nanometer resolution and single-digit nanometer linearity errors. The capacitive sensors measure the output of the positioning carriage directly enabling superior accuracy and repeatability. When coupled with Aerotech's Q-series controllers and drives, the QNPHD demonstrates sub-nanometer positioning resolution and high-positioning bandwidth. Aerotech's Dynamic Controls Toolbox and Motion Designer software packages provide a host of advanced yet easy-to-use tools such as Learning Control, Harmonic Cancellation, and Command Shaping, providing improved tracking errors and faster step-and-settle times. Aerotech's FlashConfig feature automatically identifies the stage, all operational parameters, and uploads axis calibration data ensuring safe, accurate, and true "plug-and-play" operation. The QNPHD is available with rear and side cable exit options along with mounting features for both horizontal and vertical orientations. This flexibility allows the user to orient and package the stage for the most optimal arrangement without designing various adapter plates and brackets that increase size and design complexity. Custom designs and vacuum-prepared versions are available upon request.